SAASTA, Roswika Media and UNISA joined forces on 7 July 2016 to host the first Nano News Writing Workshop this year at UNISA, Florida Campus in Johannesburg. Aimed at guiding scientists to better communicate science and nanotechnology in particular, the fully subscribed workshop brought together postgraduate students and senior researchers from different nano related sectors. The first of three workshops to be hosted in 2016, the workshop was well received by the students and the insights gained were invaluable. The workshop, venues and dates were organised by SAASTA|NPEP science communicator, Dr. Mthuthuzeli Zamxaka, and Deputy Director of the Nanotechnology and Water Sustainability (NanoWs) Research Unit, Prof. Sabelo Mhlanga. SAASTA’s Science Communication Manager, Michael Ellis, kicked off proceedings by presenting the importance of science communication and the involvement of scientists in outreach and awareness. He also indicated how the researchers could work with SAASTA and cited some examples of different modes of nanotechnology public engagement and science communication opportunities. 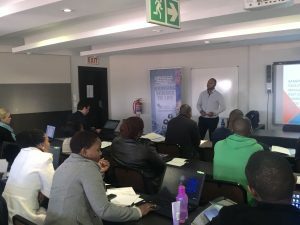 Thereafter Roswika Media’s Managing Editor and Science Communicator, Evans Manyonga, who was the workshop facilitator on the day, presented a full day workshop on nanoscience communication. The core aim of his presentation was to provide scientists with a better understanding of how to use popular writing to develop a narrative about their work in order to ensure various audiences receive and easily understand stories they write and their findings. Beginning the workshop Manyonga mentioned that there was a big gap between scientific advances and progress and the dissemination of this information to the wider public and even the greater nanoscience community. “The aim of this workshop is to ensure science students, scientists and members of the science community are equipped with the essential skills to communicate with the general public through enhancing their communication and writing skills,” Manyonga explained. The workshop was divided into three phases (media theory for scientists, media writing for scientists and practical exercises). There were four core areas and topics of awareness. The different modes of communicating research work. Joanne Riley, SAASTA Science Editor, together with Mthuthuzeli Zamxaka assisted with the answering of questions and with the practical exercise. Ultimately the Nano News workshop was a success and provided an enjoyable and inspiring day for everyone who attended.